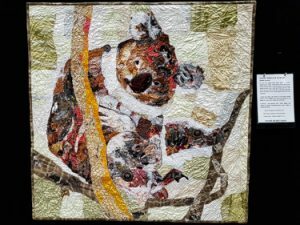 On 14th March I was privileged to be able to attend the opening reception of the WA Quilter’s Association (WAQA) Quilting as an Artform exhibition. 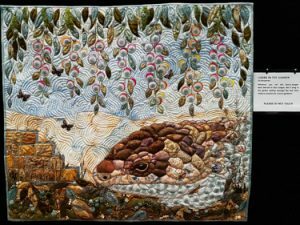 As always I was absolutely awed and inspired by the quilts and the amazing talents of the ladies who created them. 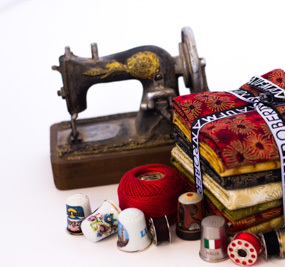 The 106 quilts covered a variety of themes from political statements to nature and landscapes to explorations of contemporary quilting techniques. 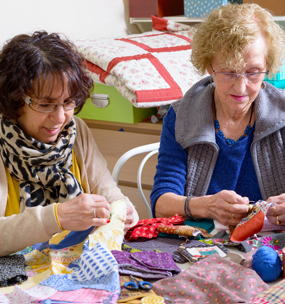 There were some old favourites and some brand new quilts to see which was lovely. I would love to share all of them here with you but there’s just not enough space! So here are a few of my favourites. PS – I apologise that the images are not all seamlessly lined up. I can only blame it on the technology. Enjoy! 21 Jumpers by Liz Humphries. 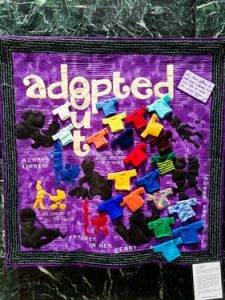 A statement on the historical practices of removing babies from young mothers and adopting them out. His Ways Are Many by Jan Campbell. 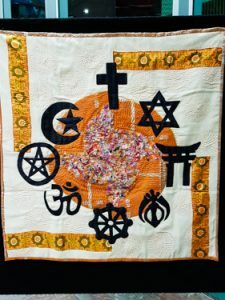 Jan reflects on civilisations spiritual journeys seeking faith. But it Should be Red by Helen Perlman. 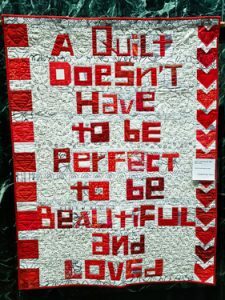 I lost the message a little in this quilt when standing in front of it but it really stands out in the photo! 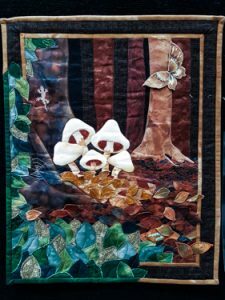 Nature’s Beauty – Explore or Exploit by Jan Rowe. 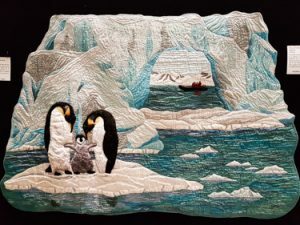 Jan expresses her hope that the natural beauty of Antarctica is simply explored, not exploited by mankind. Lizard in the Garden by Liz Humphries. I love Blue Tongue Lizards and I think Liz has captured this one beautifully. 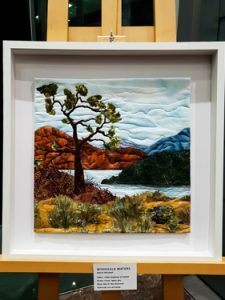 Wyangala Waters by Marie Mitchell. 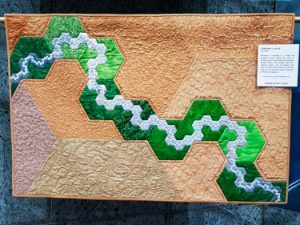 Although this quilt reflects NSW country it reminds me very much of the Pilbara. Stunning. Decaying Beautifully by Megan Byrne. 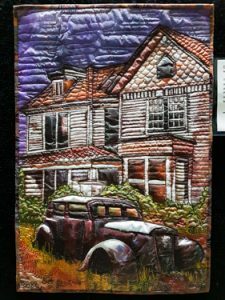 Megan explores the beauty that can be found in the old and forgotten through contemporary techniques. The Cycle of Life by Jocelyne Leath. 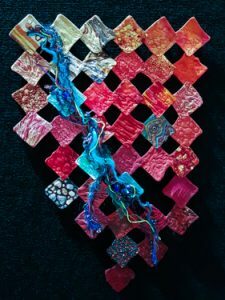 Jocelyne showcases the humble leaf and through her artist statement shares how it gives life and protection throughout its life cycle. Sleepy Koala & Friends by Natalia Tasovac. Natalia has captured the likeness of a koala perfectly, don’t you think? Rainbow Lizard by Julie McAllister. 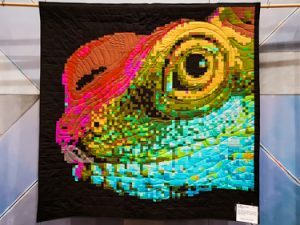 I just love this colourful lizard in pixelated form. 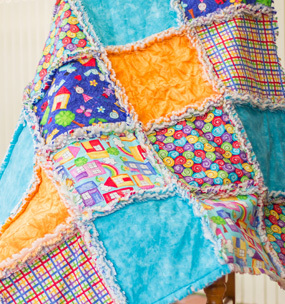 This quilt is a representation of her life’s passion – the Bobtail Lizard. Gloria 1 by Tiiu Stojanovic. 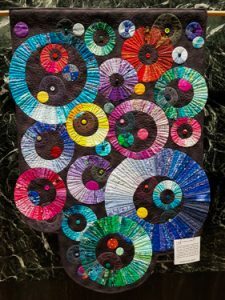 Tiiu was inspired by Gloria Loughman’s book to create this quilt depicting our sun, surf and sea. Michelle’s Dragon by Helen Godden. 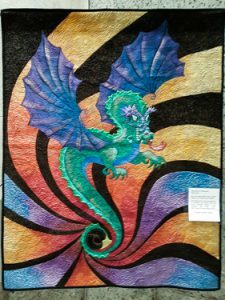 This stunning dragon was created as a gift for Michelle for a special birthday. Trying to Make a Hole by Jan Rowe. 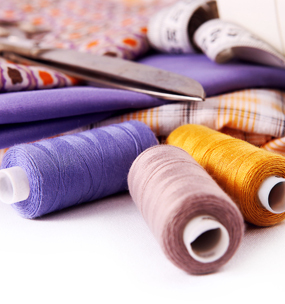 Unfortunately Jan’s attempt to create a dent in her scrap pile was not successful, although her quilt definitely was! Kimberley Creek by Pat Forster. 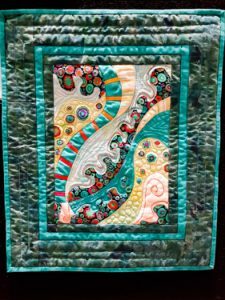 Pat is well known for using mathematics and fractals to create her quilts. This one is a great representation of the Kimberley landscape from above. 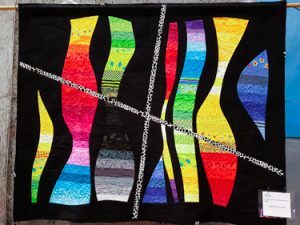 This contemporary style mini quilt had no label so unfortunately I can’t acknowledge the creator. 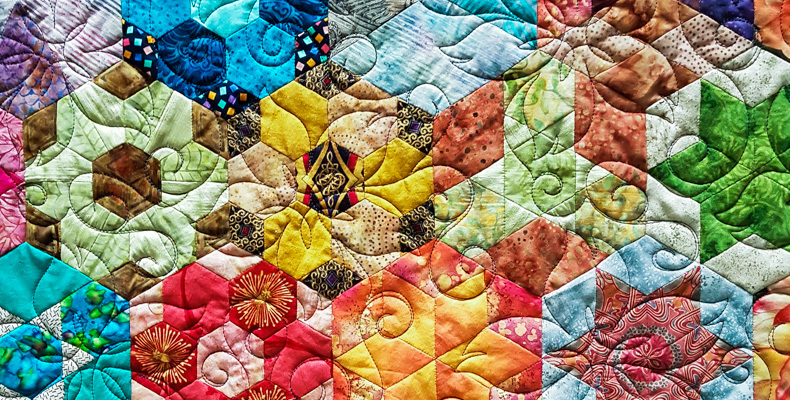 I love the colours and shapes in this quilt.